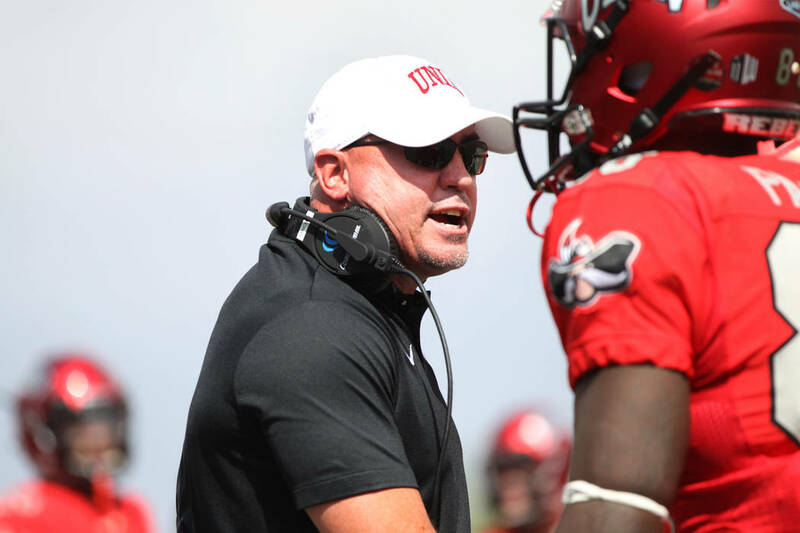 A decision on UNLV coach Tony Sanchez’s future will be announced after the season. The Rebels play UNR on Saturday at Sam Boyd Stadium. UNLV athletic director Desiree Reed-Francois remains firm in her stance that no decision will be made on coach Tony Sanchez’s future until after the season, but the question hovers over the Rebels as they head into the finale against rival UNR. Sanchez was a picture of calm Monday and didn’t seem at all bothered when the subject of his job status was raised at his weekly news conference. Maybe there’s good reason to feel that way. Sanchez would be in line for a fifth season, just like each of the four previous UNLV coaches received. “I know what we’ve done to build this program, to make it better,” Sanchez said. “I think it’s obviously disappointing where we’re at right now, but there’s some good that can come from it. Even with all the adversity, they’ve done a good job of being competitive in spurts. We’ve got to continue to grow. We’re sitting here right now unfortunately with three wins, but we’ve got two losses by seven points and one by six points. The Rebels (3-8, 1-6 Mountain West) conclude their season at 6:30 p.m. Saturday against UNR (7-4, 5-2) at Sam Boyd Stadium. UNR is a 13-point favorite in the game that will be televised on CBS Sports Network. Though Sanchez said Saturday that he expected Armani Rogers to start at quarterback, on Monday he said that decision will still need to be made. Rogers and Max Gilliam are listed as co-starters on the depth chart. Gilliam has started the past seven games, but Rogers came off the bench Saturday and played in most of the 35-28 loss at Hawaii. It was Rogers’ first appearance since suffering a toe injury Sept. 22 at Arkansas State. “We’re definitely going to use him more this week,” Sanchez said. “Max is still ready to go. I perceive going into the game — we talked about it as a staff — to use both those guys.